CM Magazine: I Dare You NOT to Yawn. I Dare You NOT to Yawn. Hélène Boudreau. Illustrated by Serge Bloch. Somerville, MA: Candlewick Press (Distributed in Canada by Random House Canada), 2013. Kindergarten-grade 2 / Age 5-7. There you are, minding your own business, building the tallest block tower in the history of the universe or dressing up the cat when suddenly...your arms stretch up, your eyes squish tight, your mouth opens wide, your tongue curls back, and - mmm. . . rrr. . . yawwrrrr - a yawn pops out. Next thing you know, you're being sent upstairs to get your pajamas on! 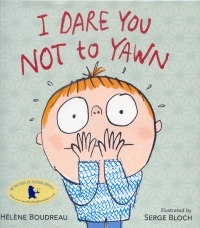 Readers are officially dared not to yawn as they read their way through this delightful picture book! Canadian author Hél�ne Boudreau and illustrator Serge Bloch have combined their talents to craft the perfect story to be shared aloud with a group of giggling Kindergartners or snuggled up and enjoyed with a special preschooler. Even older audiences will enjoy the challenge of completing this book without sneaking out a yawn or two. The illustrations perfectly capture a youngster's frustration when an inadvertent yawn interrupts his activities and his mother determines that there is no more left of his day and sends him off to bed. Bloch's whimsical drawings depict a young boy's busy action-filled day, including his dressing up a cat, creating block towers, and exploring his imaginary world. Story characters are created using hastily scribbled lines - a minimalist artistic style which successfully captures a range of emotions and is guaranteed to engage a young audience. This approach is contrasted with areas of detailed textures such as those found in the bedroom furnishings and the boy's shirt � recognizing the small details which make up an important part of any youngsters' world. Bloch has done a splendid job of artistically supporting and extending the text of this cautionary tale. Boudreau has also provided a minimalist text as she develops her warning tale about yawns. Her clever use of sound effect words, the placement of punctuation pauses, and emphasis of words through block capitalization, perfectly set the stage for the accompaniment of Bloch's frenzied illustrations. 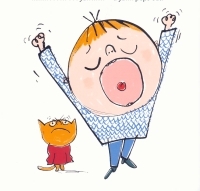 Boudreau successfully captures a young child's perspective on yawns by using logic and examples that will resonate with the reader's own memories and experiences. Despite the young boy's proffered advice on ways to avoid yawns - to "stay away from huggable stuffed animals, soft cozy pajamas, and your favorite blankie" � the yawns just keep sneaking their way onto the pages of this book. You may start reading this book with a steely determination not to yawn, but allow yourself to become captivated by the infectious nature of this story and you will find that "your arms stretch up, your eyes squish tight, your mouth opens wide, your tongue curls back" and you certainly will find yourself yawning as well! Humorous, engaging, silly, and definitely contagious, this picture book is highly recommended as an addition to all elementary school library collections and as the perfect gift for any active preschooler. Be warned that any attempt to read it aloud to a group of children is guaranteed to dissolve into one big giggling yawnfest of laughter because "yawns are sneaky. They can creep up on you when you least expect them." Joanie Proske is a teacher-librarian in the Langley School District, Langley, BC. NEXT REVIEW | TABLE OF CONTENTS FOR THIS ISSUE - May 10, 2013.